After this session with the high school groups, we had lunch and then the 4th through 8th graders came. It was a very successful day, and we'll do it again next year, hopefully in more schools around our area. The ensemble will now fly to Ohio for Cincinnati to be guest artists at the American Choral Directors Association regional conference, perform some concerts in Ohio, go onto Tuscon for ACDA and then to Connecticut for our annual concert in New Canaan and Youth Choral Festival in Darien. 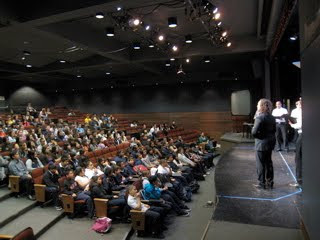 Meanwhile I will continue visiting schools here in the Bay Area and planning for the our national festival.